Maple Cap Strat with Don Lace Pickups & Eric Clapton Mid Boost Circuit. The Fender Eric Clapton signature Stratocaster with active pickups mid boost overdrive is just shy of £1,400. 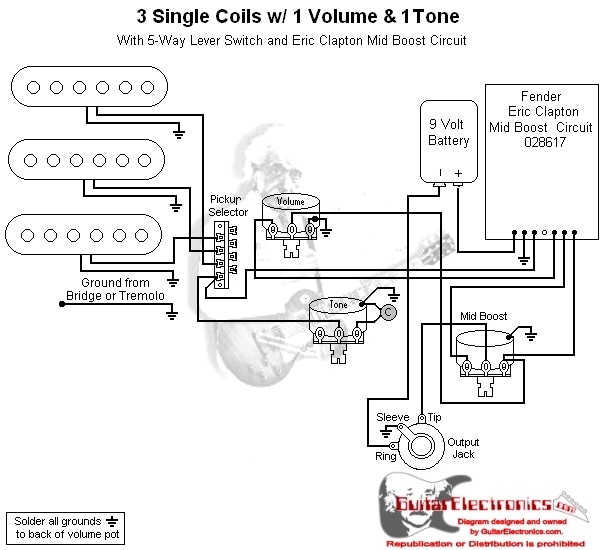 If you are wanting a Clapton Strat it is much more cost effective to have the mid boost circuit installed aftermarket. Clapton Mid boost installation instructions. You will need to use a set of noiseless pickups with the Clapton boost. 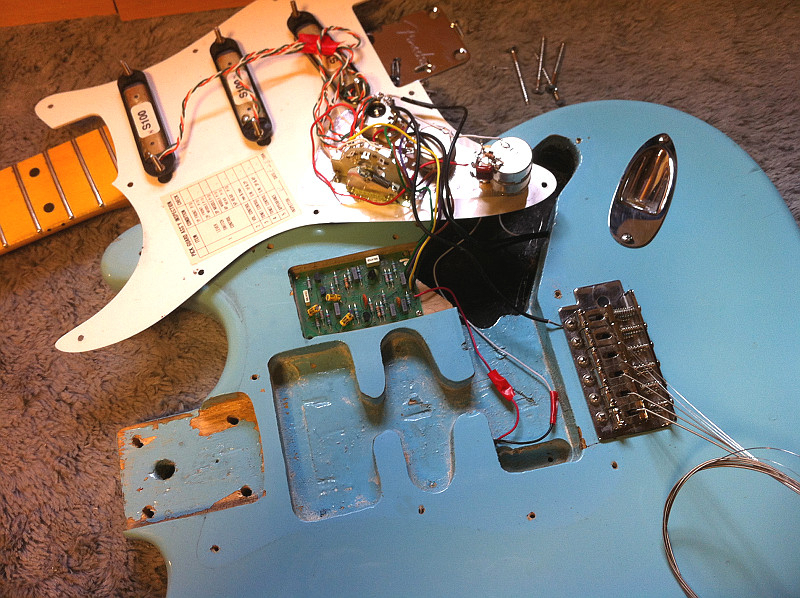 Ordinary single coil pickups will sound terrible when the boost is turned up to full, as the circuit will also amplify any electrical interference. I recommend using either Fender Noiseless, Kinman or Lace Senor pickups. 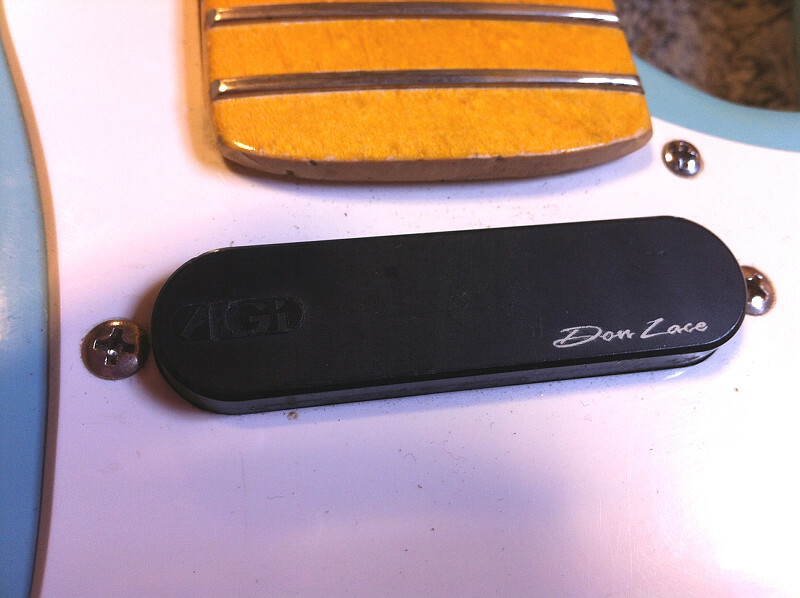 The pickups used in the build are one of the earliest noiseless Lace Senors made by Don Lace, S100 pickups. The boost circuit needs to be physically mounted inside the guitar body somewhere. 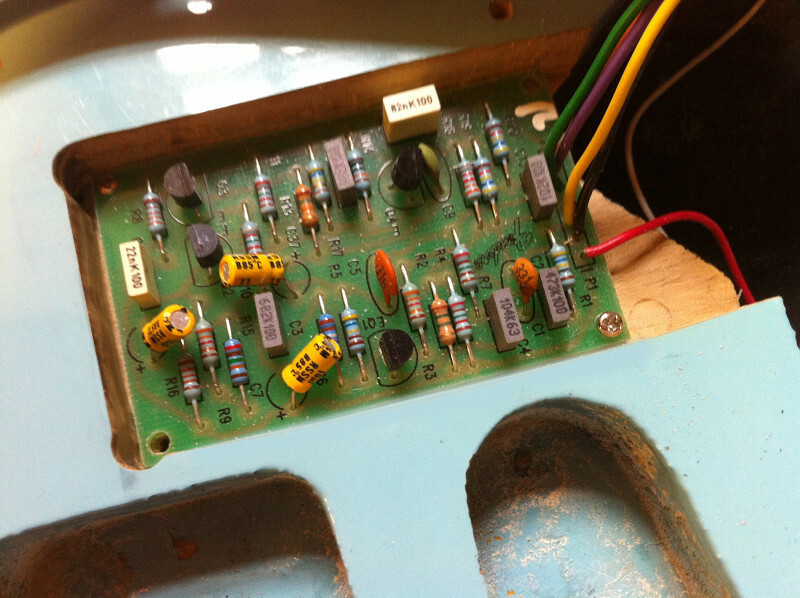 A good place is under the scratch plate just above the pickup selector. If you don’t want to use a router, sometimes it can be possible to mount the board in the control cavity (if there is space). 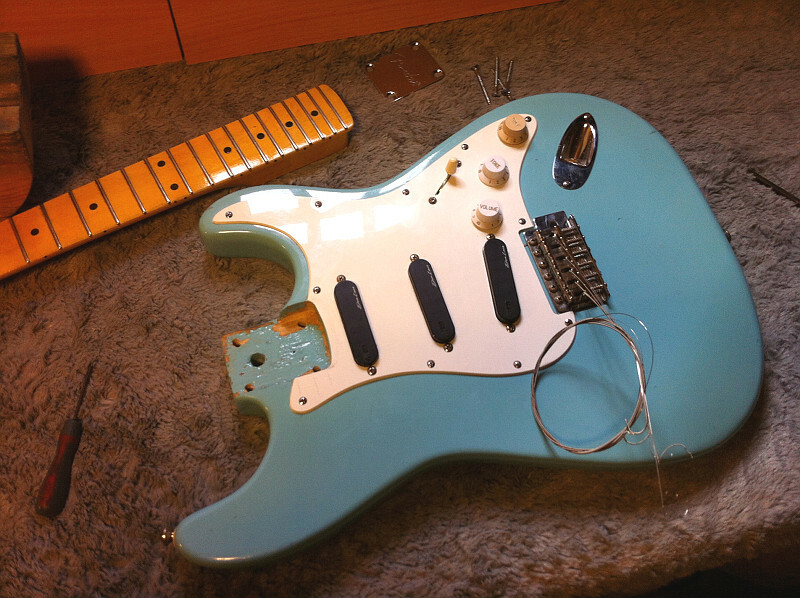 Unusually this Strat body has been converted into a hard tail by neutering the bridge block (in this case a large brass block) with epoxy resin. 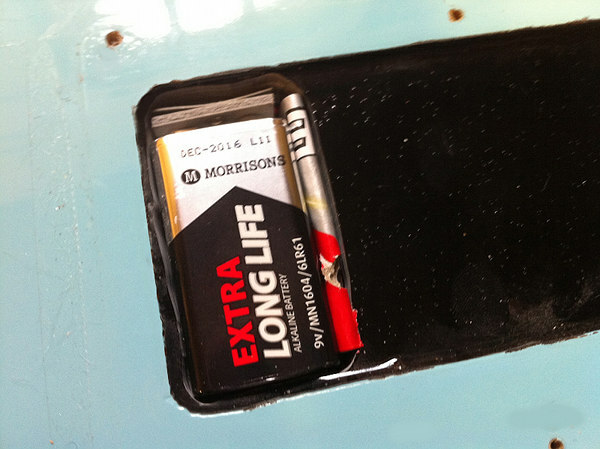 A good place to mount the 9v battery with easy access. You can also mount a Clapton boost in a pedal, it’s very easy to do. I use a bespoke Clapton boost pedal as a pre-amp for a passive piezo acoustic guitar pickup with excellent results. Here’s a clip of Cream playing at the Royal Albert Hall is 2005. See if you can spot when Eric is playing with the boost on. And Sunshine of Your Love – at 2:10. The Clapton circuit works also fine with full-sized humbuckers. Hi John, I have yet to find a set a pickups it doesn’t work well with. I use the boost circuit mounted in a floor pedal to balance a passive piezo pickup in an acoustic guitar with excellent results.